This is Notre Dame’s 9th trip to the Final Four. Friday night’s semi-final against UConn will be the eighth time the Huskies and Irish have played on the final weekend with the Irish winning four of the previous seven contests. ND is 4 and 1 in semi-final games against Connecticut including last year’s overtime thriller. When the two teams tangled for the first time this season in December, the Irish and Huskies were ranked #1and #2. The Irish scored the game’s first basket and again led briefly 4-2 two minutes in. The Huskies took the lead shortly thereafter behind freshman Christyn Williams. Hailed as the top nation’s top player after her high school career, Williams was aggressive driving to the basket from the start and scored 16 points in the first quarter. She was 7 of 8 from the field including 2 of 3 from beyond the arc. ND made 50% of its shots in the quarter but trailed after one 27-22. The Irish battled back in the second quarter with Jackie Young and Brianna Turner combining for 13 of the team’s 19 points. UConn only made 7 of 20 field goal attempts (35.0%) for 17 points. UConn senior star Katie Lou Samuelson was scoreless in the first half, and Notre Dame was only three back at halftime: 44 to 41. Notre Dame pulled to within two on a three-pointer from Marina Mabrey with 4:20 to go in the third quarter, only to see the Huskies outscore the Irish 10-6 the rest of the way to take a six-point lead heading into the fourth quarter. After shooting 51.5% (17 for 33) in the first half, the Irish slumped to 30% (6-20) in the third quarter. The shooting didn’t improve in the final quarter as the Irish only managed to score 12 points — 4 of 14 from the field (28.6%) — and the Irish never pulled closer than six points before UConn pulled away to win by 18. The Huskies only made 6 of its 16 field goals (35.7%), but they went 12 for 14 from the free throw line in the final quarter. ND’s leading scorer, Arike Ogunbowale, was 0 for 5 from the field and her frustration boiled over with a technical and then an unsportsmanlike foul, which helped UConn build their lead with free throws. Williams ended as the game’s high scorer with 28 points. Samuelson scored 15, all in the second half. Napheesa Collier added 16 points and 15 rebounds, even though she sat out a good deal of the fourth quarter with four fouls. The Irish played a horrible second half offensively — just 10 for 34 from the field (29.4%) including 1 for 6 from three (16.7%). After shooting better than 50% in the first half, the second half shooting woes dropped ND to 27-67 for the game (40.3%). The Irish only made 1 of 12 three-point attempts and just 16 of 24 from the line (66.7%). The Huskies out-rebounded the Irish 46 to 41 and limited the Irish to 38 paint points, while they tallied 42. UConn also led in second-chance points (17-10) and points off turnovers (11-3), even though the Irish only had 9 turnovers vs. 7 for the Huskies. Jackie Young led the Irish with 18 points (6-14 from the field and 6-10 from the line), Ogunbowale was 6 of 18 from the field, 0 for 6 from three, 5-6 from the line for 17. Jess Shepard had 13, Mabrey 11 and Brianna Turner 10. The 71 points and 40.3% shooting was Notre Dame’s worst offensive performance of the season until the Irish played at Miami and scored just 65 while shooting 37.3% from the field. 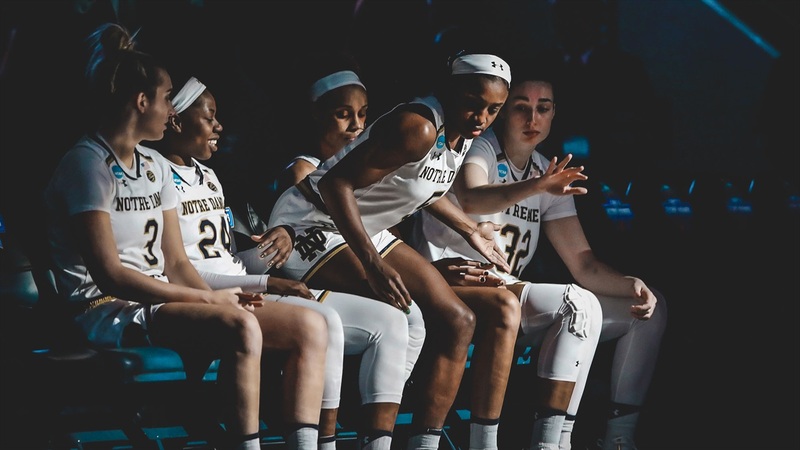 The Irish weren’t prepared for the breakout game by Christyn Williams, who was 11 for 16 from the field, including 2 for 4 from three, and 4 for 5 from the line. The rest of the Huskies shot 39.0% from the field and just 15.4% from three, but Williams set the tone early and help put the Irish in an early hole from which they never recovered. Since that early season matchup, Notre Dame has gone 27-2 with conference road losses at North Carolina and Miami. UConn won 29 of its next 31 games with road losses at Louisville and top-ranked Baylor the only blemishes on its overall 35-2 record. The Huskies average 82.9 points a game, while the Irish got in high gear after the Miami loss to become the nation’s highest scoring team at 89.0 points per game. In winning the last 13 games, the Irish have averaged 93.7 points per game with an average margin of victory of 27 points. UConn is on a 17 game winning streak and has beaten its opponents by 27 points per game across the season. The Huskies scored 69 and 80 points in the two regional games last weekend, while the Irish scored 87 and 84. Defense has been a constant for UConn all season. Opponents average 55.9 points per game. While the average scoring output for ND opponents is 64.2 points, the Irish schedule was rated the toughest in the nation, while UConn’s was less challenging. The Huskies still limited the best and highest scoring teams on its schedule to 68 (Baylor), 78 and 73 (Louisville), and 71 (Notre Dame). Only six opponents all season have managed to score 70 or more against UConn. Like the Irish, all five UConn starters average in double figures, led by first-team All-American Napheesa Collier, who has averaged 21.0 points and 10.8 rebounds. The 6’2” senior has made 61.5% of her field goal attempts and 69.7% from the line. Collier has a team-best 60 blocks on the season, is second with 56 steals, and has registered 133 assists against 75 turnovers for a 1.8 assist to turnover ratio. Collier has averaged 33.2 minutes a game and has played every minute of the last three games. Fellow senior Katie Lou Samuelson is at 18.5 points and 6.5 rebounds in 32.9 minutes per game. Her shooting percentages are down a bit from last season — she’s at 45.5% from the field overall and 37.9% from three. However, she can be a devastating shooter when she gets in rhythm, as her 7 for 12 effort from three and 29 point effort against Louisville last weekend demonstrates. She’s passed out 126 assists (2.4 A/TO), has 41 steals and 19 blocks. A great perimeter player, her 6’3” length gives her an advantage against most opponents inside as well. Both Collier and Samuelson have scored over 2,300 points in their careers. Crystal Dangerfield is at 13.7 points per game. Only 5’5”, she is a ferocious on-ball defender, and her 58 steals leads the team. She has 216 assists with a 3.0 A/TO ratio. She’s shooting 43.8% overall and converts 36.1% of her three-point attempts. She’s only missed 5 of 66 free throw attempts (92.4%). The other two starters, Megan Walker and Williams, were rated the #1 player entering college the last two seasons. With other experienced options last year, UConn was able to ease Walker into the college game. She's played a critical role this season averaging 31.3 minutes, 12.0 points and 6.7 rebounds per game. At 6’1” she’s comfortable inside and out. She’s made a team-best 40% of her three-point attempts (48-120) and is the team’s second-best rebounder. She’s scored over 20 points four times with a high of 34 against conference foe Tulane. Williams averaged 31.9 minutes per game. Her 28 point outburst against Notre Dame was the only time she scored 20 or more all season. The 5’11” freshman is currently at 11.5 points and 3.2 rebounds per game. Williams has made 50% of her field goal attempts, 36.3% from three and 73.9% from the line. She’s converted 58.3% of her two-point attempts. The Huskies don’t have a deep bench and all five UConn starters have played all 40 minutes on numerous occasions. Depending on the flow of the game and the foul situation, the Irish may only see one player off the bench — 6’4” freshman Olivia Nelson-Ododa, who averages 4.4 points and 3.8 rebounds in just 14 minutes of action. Despite the limited playing time, Nelson-Ododa is second on the team with 53 blocks. Surprisingly, the Irish hold a slight edge in most statistical categories: points 89.0 to 82.9; field goal percentage 51.6% to 49.3%; free throw percentage 74.1% with 585 makes vs. 73.4% and 484 makes; rebounds 44.0 vs. 41.4; rebounding margin 10.5 to 6.7; assists 20.6 vs. 19.7; steals 9.0 vs. 8.1; and blocks 5.1 vs. 4.4. The Huskies hold the edge on three-point percentage and makes per game 36.6% and 8.0 vs. 36.3% and 4.6. UConn limits opponents to 55.9 points, 34.0% from the field and 28.0% from three. ND’s opponents have averaged 64.2 points, 37.1% from the field and 28.6% from three. The Huskies have been better with the ball — just 11.8 turnovers vs. 13.8 for ND — leading to an assist to turnover ratio of 1.7 for UConn vs. 1.5 for the Irish. During the current 13 game winning streak, the Irish are averaging 22.4 assists and 11.8 turnovers (1.9 assist to turnover ratio). Irish Notes: Arike Ogunbowale’s season scoring average is now at 21.5 points per game. She could go scoreless over the next two games and still average over 20 points a game for the season. She is not only Notre Dame’s all-time leading scorer, but will also become the only Irish player ever to record back-to-back 20 point per game seasons. Ogunbowale is averaging 25.3 points in the four NCAA games. She’s made 50% of her two-point field goal attempts, 36.8% from three, and 91.7% from the line. Jess Shepard is at 19.0 points, 12.5 rebounds and 4.0 assists per game in the NCAA tournament. Her assist to turnover ratio is 2.3. Her career totals are 2,309 points and 1,225 rebounds. Brianna Turner needs just ten points to become the third 2,000 point scorer on this Irish team. Turner needs four more blocks to tie Ruth Riley at 370. After taking the career rebounding record from Riley recently, she’s now at 1,021 career boards. Turner is averaging 14.8 points, 7.8 rebounds and 4.0 blocks in the NCAA tournament. She’s made 67.6% of her field goal attempts and hit 11 of 12 free throws. Jackie Young’s is averaging 17.8 points and 8.3 rebounds over the last four games. Her assist to turnover ratio is 2.7. She’s become more aggressive offensively with an average of 13 shots per game vs. 10.5 over the whole season. Marina Mabrey is having a tough shooting stretch as she battles a hyper-extended knee. However, she’s leading the team with an average of 5.8 assists over the four NCAA games with an assist to turnover ratio of 4.6. Friday night’s game is scheduled for a 9 pm tip-off, but will probably be a bit after that since it follows the evening’s first game pitting Baylor against Oregon. The ND - UConn game will be televised on ESPN2. In-game updates will be posted below.